Earlier this week I took a couple of passes through the White House Plaza, first to take some pre-work bicycle glamour shots and later to enjoy a bit of afternoon sun. 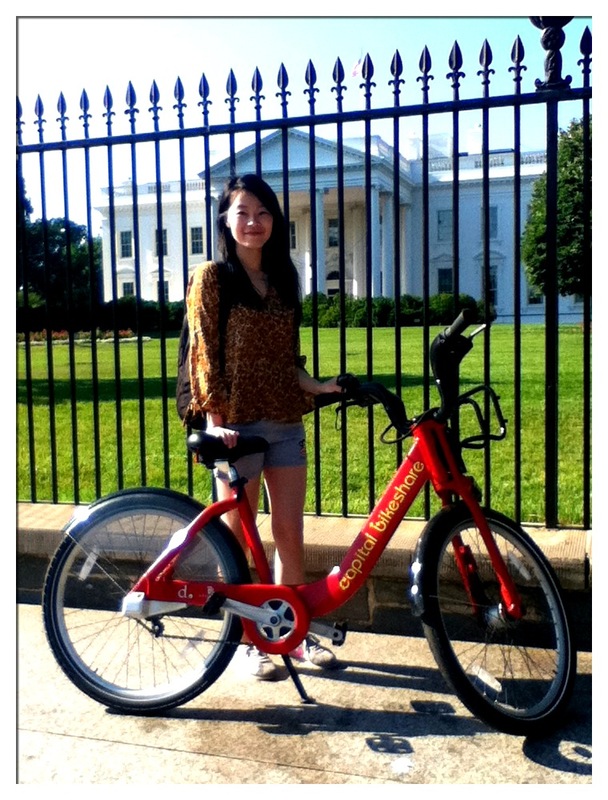 On my a.m. stop, I saw a Capital Bikeshare tourist. Awesome! I love seeing tourists navigate Washington, D.C., using Bikeshare bikes. She asked me to take a photo for her in front of the White House, and then I took one extra for myself. Go Bikeshare! I pedaled to my j-o-b, spent a few hours there doing j-o-b-related things, and then took a midday walk. 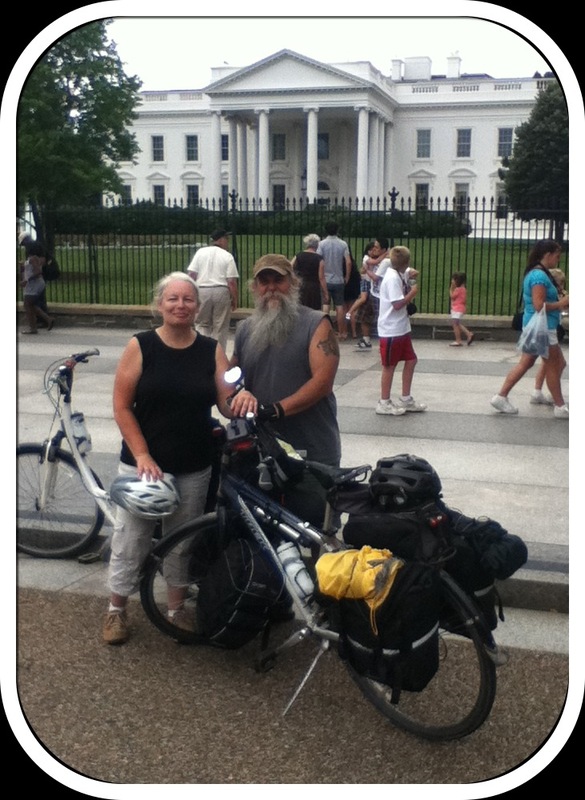 I meandered back through the White House Plaza, and as I was about to return to the office I saw two fully loaded bicycles roll up near the White House. I sprinted over to them in my non-sprint-friendly heels and excitedly asked them where they had ridden from. They had JUST completed the full trek of both the Great Allegheny Passage and C&O Trails. It took them nine days to complete full 330 miles. They asked me if I rode, too. I had forgotten that I was walking around incognito. I said it must feel strange to come off the C&O trail into the heart of Washington, D.C. on a weekday. One of them said “Yeah, it’s crazy. We just got here and there’s horns honking and taxis everywhere!” They asked me to take their picture and then I grabbed a photo with my own camera as well. I thought it was so awesome that my little lunch break stroll coincided so perfectly with their tour completion. It made my whole day better, although I was sad to have to go back to the office. A few hours later, though, it was my turn to ride. And now, it’s the weekend. Let’s go ride our brains out! I rode into DC one summer day almost 40 years ago from the C&O Canal with my firend on our Schwinn Continentals. Changed my life, that trip did. The city was festooned with Soviet flags for Brezhnev’s visit. We stayed at the Youth Hostel (very close to the White House) and argued the merits of Apartheid with a large group of white South African teens who were our age (15 -16). They vigorously defended the policy. We too were from Pittsburgh, but there was no connecting trail then so my sister and her husband drove us to Cumberland, MD and picked us up too. I vividly remember riding through the Paw Paw tunnel, navigating the locks. Fabulous time! Some day…I’ll get back there and ride it again. Awesome recount, Steve! Maybe Rootchopper is right… PBP, then the GAP and C&O.